The Great Western Society at Didcot Railway Centre was granted the Queen’s Award for Voluntary Service, in recognition of the voluntary work that has taken place at Didcot Railway Centre for over 50 years, and could be deemed particularly apt in this, their 50th anniversary year. The wide ranging skills of the volunteers, past and present, can be seen in how the Centre has developed, from a railway depot, into a globally recognised centre of excellence in railway preservation. The work includes the restoration of steam locomotives, historic carriages and wagons, and buildings sourced from many outposts of the original Great Western Railway. The Centre now has an unmatched collection of locomotives, rolling stock, and small and large artefacts of railwayana from a single railway company. You can find out more about the Queen’s Award for Voluntary Service on the www.gov.uk website. Viv Cooper was awarded a British Empire Medal in the 2017 New Year's Honours List. Joining the Great Western Society in her teens, 53 years ago, Viv quickly became involved with administration, which has continued to the present day. The first locomotives and coaches purchased, or cared for on behalf of fellow members, were based at Totnes in Devon. Here Viv would also help with cleaning the locomotives as well as promoting the Society at open days, on sales stands and in other forms of publicity. Once the Society moved to the Didcot Railway Centre, which is now its home, Viv, for some years, took on the duties of liaising with British Railways for open days and filmings plus arranging VIP entertaining. For many years her home telephone number was the Society's main point of contact. Viv has covered most aspects of administration in the Society, including forty years of producing newsletters for members and latterly transferring them to digital format. Currently company secretary for the Society's rolling stock holding company, Viv is now gathering together the Great Western Society's own history. She has always felt part of a team to make the Great Western Society and Didcot Railway Centre successful and accepted the BEM on behalf of all the volunteers. Married with three daughters and four grandchildren, Viv lives in Maidenhead, Berkshire. The main photograph shows Viv in May 1964 with No 1466, just a couple of months after the Great Western Society had purchased its first locomotive, and apparently before health and safety had been dreamed of - The inset shows Viv on the same locomotive in less perilous pose in January 2017. Mike Peart, one of original four 'schoolboys' founders of the Great Western Society adds his congratulations “Volunteering is obviously the secret of eternal youth! Well done Viv”. Didcot Railway Centre was awarded Full Accreditation by Arts Council England. The Accreditation Scheme is a benchmark for museums, setting nationally agreed standards in collection care, public services and museum management. Gaining Full Accreditation status shows that Didcot Railway Centre is meeting the national standard and is key to gaining future grant funding to develop the Centre. Richard Croucher, Chairman of the Great Western Society, which runs Didcot Railway Centre said “I am delighted that Didcot Railway Centre (DRC) has achieved full accreditation status. DRC first obtained museum registration over a decade ago and as museum standards have been raised, we have been invited to jump the next height which has been achieved each time. There are currently just under 1,800 museums participating in the Accreditation Scheme, which sets nationally agreed standards for museums in the UK. The Accreditation lasts for three years and defines the good practice and standards that help museums to be the best they can be, for current and future users. Didcot Railway Centre flew the flag for the heritage railway sector in the South East, at the Beautiful South Awards on 27 November, by securing a Highly Commended accolade as a visitor attraction. Organised by Tourism South East the Beautiful South Awards has run for over twenty years and celebrates the very best the South East has to offer for all types of tourism businesses including B&Bs, hotels, holiday parks, self catering, visitor attractions as well as recognising those businesses that have gone the extra mile on accessibility, sustainability and great customer service. The ceremony was co-hosted by Tourism South East Chairman, Ken Robinson CBE and travel journalist and broadcaster Alison Rice. Our category of award was sponsored by Flagship Consulting and the event overall by Shepherd Neame. Didcot Railway Centre was the community winner in the Science and Innovation category of the Business and Community Awards (BACAs) organised by Didcot First. Didcot First is an independent organisation, committed to bringing together commerce, statutory bodies, voluntary agencies, and the general public to ensure that Didcot is a positive place to live, work and invest. The BACAs scheme is now in its fifth year. The award was won for implementing the Electronic Point of Sale (EPOS) system which allows us to claim gift aid, and hence increase our funds. There is a small cash prize which we are going to use to implement one of the recommendations from our recent Visit England - Visitor Attraction Quality Assurance Scheme (VAQAS) assessment. This inevitably involves toilets - Visit England are rightly concerned with quality toilets! The Great Western Society was awarded the Heritage Railway Association Large Group Award for 2011. This recognises 50 years of excellence within the railway preservation movement, culminating in the restoration to working order of Steam Railmotor No. 93, which entered traffic in May this year after a seventeen year rebuild . 2011 has been arguably the most successful year ever for the Great Western Society and Didcot Railway Centre. It has organised several major launch events, including one for the newly restored King class locomotive 6023, outshopped in blue livery, as well as the Steam Railmotor. In April two Kings, 6023 and 6024, were together at Didcot, and in June the new-build A1 pacific Tornado was posed with the Steam Railmotor. Visitor numbers to the railway centre have increased by about 13% in 2011, compared with 2010 which itself was an improvement on previous years. With the security of the 50 year lease, work has already started on a new services building to improve the capacity of the electricity supply for planned visitor enhancements. The GWS was previously the recipient of this prestigious award in 1974 to recognise its running the Vintage Train of GWR locomotives and carriages on the main line. It received the award again in 1981 for developing Didcot Railway Centre as a major visitor attraction, together with giving a major overhaul to the boiler of national collection locomotive Evening Star, enabling it to run on the main line. 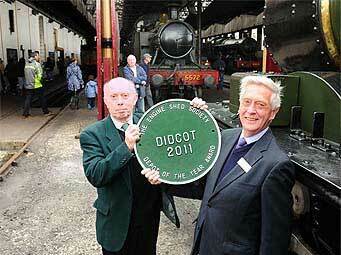 Didcot Railway Centre was presented with the Engine Shed Society's - Depot of the Year Award. The plaque was presented to Richard Croucher by Eddie Lyons, Chairman of the Engine Shed Society and long standing Great Western Society member. In his youth (in the 1960s) Eddie produced a comprehensive book on all Great Western Engine Sheds, published by OPC and regarded by many as the definitive work on the subject. Last year's award went to Barrow Hill. To build up a full list of every single standard gauge MPD, sub-shed, stabling point and works complex that ever existed, including industrial, military, multiple unit and underground depots. To monitor the status of surviving shed buildings or site re-usage of those which have been demolished or converted. To liaise with official bodies and pressure groups with a view to preserving or listing depots of outstanding architectural value. To record for posterity the reminiscences of former shed employees. The Steam Railmotor project was given an award by The Transport Trust for restoration work being undertaken on Railmotor 93. On Monday 14 June Society Chairman Richard Croucher and Vehicle Project Manager Graham Drew attended the Trust's award ceremony at London's Camden Roundhouse, on behalf of all the Project Team. The award was presented by HRH Prince Michael of Kent. As a fitting start to the GWR 175 celebrations, Didcot Railway Centre was awarded a 'Red Wheel' plaque by the Transport Trust, recognising the Centre as a transport site of special significance. The plaque, which is mounted on the outside of the Great Western Trust museum, was unveiled by Sir William McAlpine on Good Friday. The award is part of a major new transport heritage initiative to commemorate Britain’s rich and globally important legacy in the development of transport. The Red Wheel programme will eventually mark hundreds of sites of special historic interest with a distinctive Red Wheel plaque and will be administered by The Transport Trust, the hub of the transport preservation and restoration movement in Great Britain. The Didcot plaque reads: ‘Didcot Railway Centre – 1932 Great Western Railway Engine Shed complex, now developed to preserve the spirit and style of the GWR for future generations’. Mike Bedingfield presents Didcot Railway Centre's Ann Middleton with a plaque. At a recent tourism industry event, hosted by Tourism South East, at Farmer Gow’s Farm attraction at Fernham near Faringdon, Oxfordshire, Didcot Railway Centre officially received their VisitBritain Visitor Attraction Quality Assurance Service Award (VAQAS). Just one of four attractions in Oxfordshire to be recognised in this way, Didcot Railway Centre joined over 40 other tourism businesses to exchange ideas, contacts and information about some of the key challenges facing the tourism industry today. The event also enabled those attending to learn how their business can gain support from services offered by Tourism South East. The Transport Trust has decided that the Great Western Society should be awarded the 2008 David Muirhead Award for the restoration of 6023 King Edward II. The Award includes a cheque for £2000. The South Oxfordshire ‘Investors in Education’ Awards Ceremony 2009 took place at The Cornerstone Arts Centre, Didcot on Wednesday 11th February. The Winner in the ‘Work Experience’ category was the Great Western Society, Didcot Railway Centre, in recognition of its ongoing work-related learning support. The ceremony was arranged by the Oxfordshire Education Business Partnership and Ed Vaizey MP presented Awards to the winners. David Bevan, the Society’s Education Officer, accepted the award on behalf of The Great Western Society. Didcot Railway Centre offers a wealth of learning in science and heavy engineering. The nomination by St. Birinus School and the winning of the award will be a great encouragement to the members of the restoration groups who welcome the opportunity of passing on their skills to students. The Great Western Society was honoured with an Engineering Heritage Award by the Institution of Mechanical Engineers in recognition of its achievements at Didcot Railway Centre. As well as Nigel Southwood and Richard Croucher the presentation was attended by Brian Walker, Vice Chairman Thameswey Region of IMechE; Andrew Myhill, Public Affairs Officer IMechE; and Peter Chatman, Deputy Chairman of Great Western Preservations Ltd, the rolling stock holding company at Didcot Railway Centre. The presentation was made on the footplate of locomotive 5322, which is nearing completion of its restoration. 5322 was built in 1917 to one of the standard designs introduced by George Jackson Churchward, Chief Mechanical Engineer of the Great Western Railway from 1902 to 1922. Churchward's highly successful locomotive policy incorporated features that were adopted by the other British railway companies through the first half of the 20th century. The Firefly Trust was presented with the 2005 John Coiley Memorial Prize for locomotives on 9th April 2006 at Didcot Railway Centre. The award, given by the Heritage Railway Association, recognises the Trust's achievements, in building a new broad gauge locomotive. The original ‘Fire Fly’ was the first locomotive designed by Daniel Gooch, first locomotive superintendent of the Great Western Railway, and was one of a class of sixtytwo; built in May 1840 it ran until 1870. Gooch took advantage of the broad gauge; his locomotives travelled at much faster speeds than those made previously. The Fire Fly class handled the principal trains from London to Bristol when they were new and were capable of hauling trains weighing 80 tons at speeds up to 60 miles per hour; one of the class hauled the first royal train, taking Queen Victoria from Slough to London, in 1842. The wheel arrangement is 2-2-2, the single driving wheel being 7 feet diameter, and the weight 24 tons 4 cwt. The Replica ‘Fire Fly’ was conceived by the members of the Firefly Trust and they have assembled it at Didcot Railway Centre. You can travel, on the dates listed in our Calendar of Events, behind 'Fire Fly' on a section of broad gauge railway that the Great Western Society has recreated at Didcot Railway Centre using materials recovered from a disused railway in Devon. ‘Fire Fly’ will be operating on this line together with a replica of a third class coach. The Great Western Society was Highly Commended in the Heritage Railway Association’s annual Carriage & Wagon Competition for the restoration of Great Western Railway Special Saloon Car No.9002 at Didcot Railway Centre. No.9002 was one of two identical coaches built in 1940 originally intended for railway and government VIPs and fitted out with a large saloon with settees and armchairs, a pantry and kitchen. They were immediately pressed into war service and amongst the passengers during those years were Sir Winston Churchill and General (later President) Eisenhower. Subsequently they were promoted as travelling executive suites for business firms. It was one of the first vehicles to move to the fledgling Didcot Railway Centre in 1968 when it was acquired for preservation by the late John Mynors. The award was presented at the Heritage Railway Association’s Members’ Weekend on Saturday 4 June 2005 to Mick Howse who lead the team that has carefully restored the carriage at Didcot Railway Centre. The completion of the project was notably marked by its return to service by HRH The Princess Royal when she visited the Centre in May 2003. Children in Didcot and the surrounding area join many across the country with the opportunity to experience hands-on science thanks to grants of £7.3 million in the final round of funding from ReDiscover, the renewal fund for science centres and museums across the UK funded by the Millennium Commission and major charities. These new grants will enable children to engage with science and find out how it affects their lives. Didcot Railway Centre in Oxfordshire has been awarded a grant of £134,694 to create a mobile science exhibition together with a learning centre. They will be accommodated in two specially adapted railway coaches at the Centre which will be made widely available for schools, colleges and general visitors. The exhibition will follow a historical trail of railway science and engineering through interactive exhibits and displays. The Learning Centre is designed to be flexible, with two teaching areas and information panels. The ‘Science, Learning and Railways’ project is a partnership between the Great Western Society and the local science and engineering schools, St Birinus School, Didcot and Faringdon Community College. Support is being received from several of the renowned science and technology centres in Oxfordshire. With its challenging interactive exhibits it will provide a valuable education resource in the County, be an exciting exhibition for visitors and provide a link with the abundance of science and engineering at the Railway Centre. For forty years the Great Western Society has been preserving and presenting the history, science and engineering of the former Great Western Railway. Some 4 years ago Didcot Railway Centre was registered as a museum: this generous grant for the exhibition and learning centre provides the opportunity to both develop its working museum and to expand and refresh the presentation of science and engineering. The work on ‘Science, Learning and Railways’ will be started without delay in two former British Rail Mark 2 carriages purchased from London Underground and is due to be completed in readiness for opening at the end of December 2005. The £34 million ReDiscover fund is a joint venture between the Millennium Commission, the Wellcome Trust and the Wolfson Foundation and represents an innovative partnership between the National Lottery and major charitable funders. It was set up to support institutions which promote public understanding of science to renew their science, education and technology exhibitions to keep up with advances in science and technology and continue to provide high quality education. The Great Western Society was awarded an Investors in Education Award at a presentation on 19th January 2005 from the Oxfordshire Education Business Partnership in recognition of our support for the work related learning curriculum of St.Birinus School in Didcot, providing work experience of a high standard and ongoing work to improve delivery of a curriculum related education programme. We have provided opportunities for work experience for their students and help with business and marketing for students in their last year at school. Graham Perry, one of the founder members of the Great Western Society, now based at Didcot Railway Centre in Oxfordshire, was awarded a Member of the Order of the British Empire (MBE) in the Queen's Birthday Honours List announced today (14 June). He was one of a band of schoolboys that used to go trainspotting at Southall who in 1961 had the vision to realise that steam engines would soon be vanishing from the railway scene and he determined to ensure that at least a small part of the Great Western Railway was kept for posterity. The Great Western Society is the result of his vision. It was initially formed to preserve just one branch line train but now has a large collection of locomotives and other artifacts based in the original engine shed at Didcot. The Society celebrated its 40th anniversary in 2001, when Graham stepped down as Chairman after serving the Society for the whole of its existence. Graham said the honour recognised the ‘members' brilliant efforts’ of all the volunteers in the Great Western Society who are keeping alive the spirit of the Great Western Railway by supporting railway preservation which is now seen as an important part of our heritage and a major tourist attraction.